Quite a bit of time went into researching the insulation for under the slab. The engineers were concerned about the insulation holding up to the stresses that the wafflemat would be mitigating. Apparently no other customers of Wafflemat had required full insulation under the slab. The code in Arvada calls for under slab insulation and the recommendation for radiant heat is to insulate under the whole floor as well. Since I was installing radiant heat, I needed to find a high density product that was engineered for use under concrete slabs. 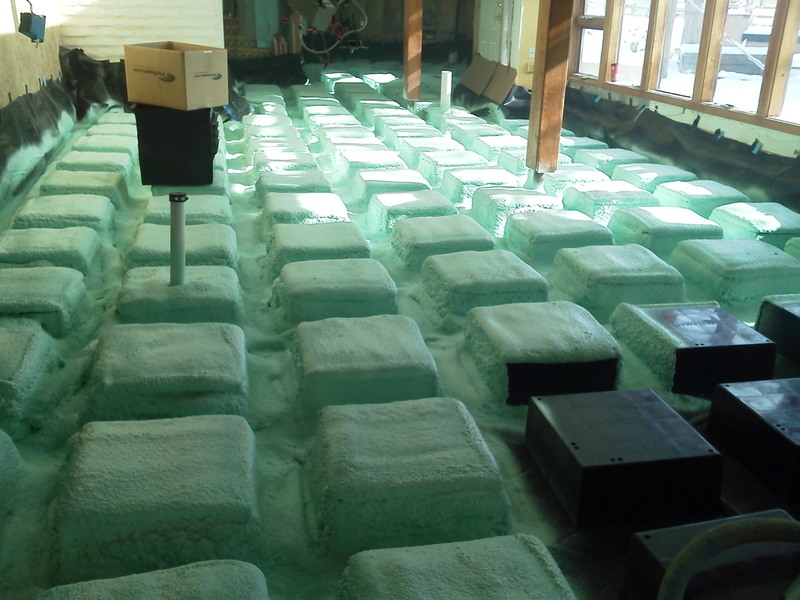 Originally I was impressed with the uses of NCFI Geofoam products from NCFI such as TerraThane. I read about a study at Colorado State University using these products. But when I spoke to the product rep, he recommended their Insulstar product, and the best applicator in the state, Jay Gurney of All Seasons Foam in Greeley, Co. 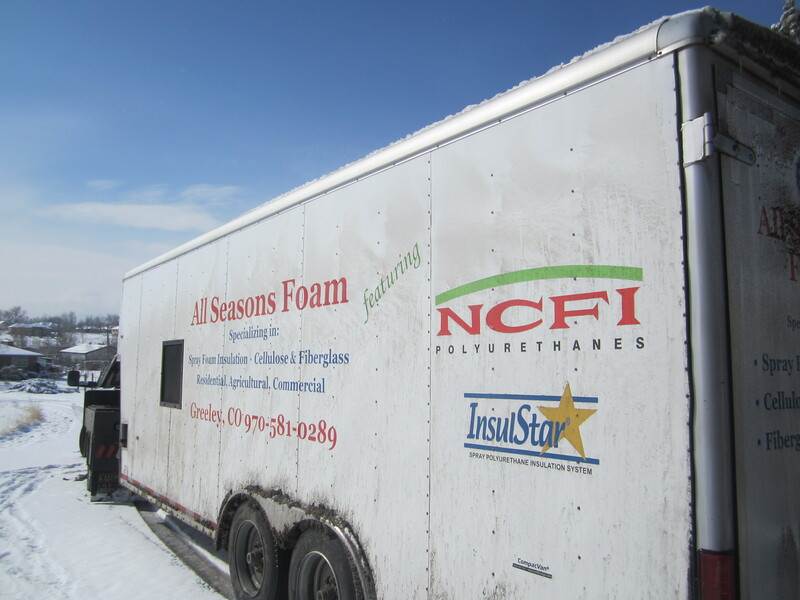 There was some trepidation from the engineers about including the foam layer, however, they used the load bearing specifications of the insulation and felt confident in specifying Insulstar under the foundation. 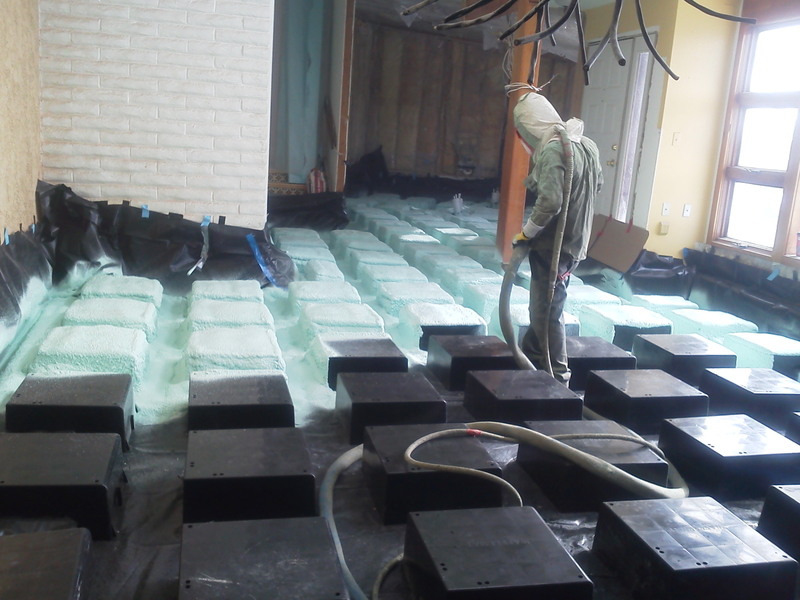 Spraying Insulstar on waffle boxes. The R value of insulation should match the edge insulation R value of 15. Although R10 is often cited as sufficient in radiant heat documents. Some resources state that insulation is only required under the perimeter 4 ft, some that the full floor should be insulated. I realized that spray insulation would be easiest to apply over the waffle boxes, and that 2″ of foam at R 13 would be pretty close to the R15 target. Adding the air space of the waffle boxes would bolster that number too. 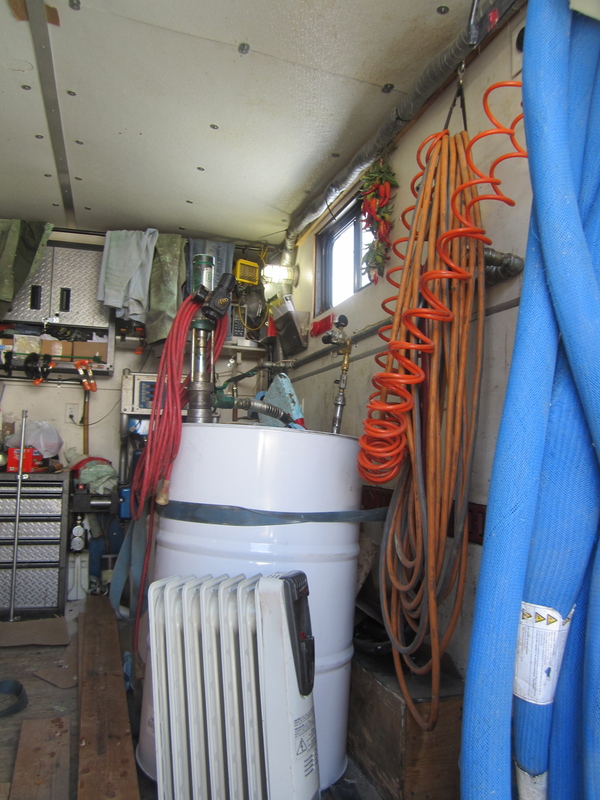 Jay is very friendly and allowed me to take photos of the product trailer that he set up himself and the installation. He even returned to the job when I smashed the plastic vapor barrier against the foundation wall and saw that it had kept insulation from reaching the corners of the slab in places. He said his reputation rests on satisfying his customers. Wafflemat is designed to take advantage of the stiffening effect of deep beams between the boxes with either post tensioning or rebar embedded into the slab. A program from the PTI (Post Tensioning Institute ) was used by the engineering team to recommend the beam depth above the foam, and the size of the rebar which is #5, or 3/4″ in the beams between the boxes. They also specified placement of the rebar at 9″ OC, #4 or 1/2″ across the entire slab. This entry was posted in Air Intrusion/Thermal Envelope, Construction, Energy Efficiency, House Systems. Bookmark the permalink.